Beekle lived in the land where all imaginary friends are born. He waited and waited for someone in the real world to imagine him into reality, but no one ever did. 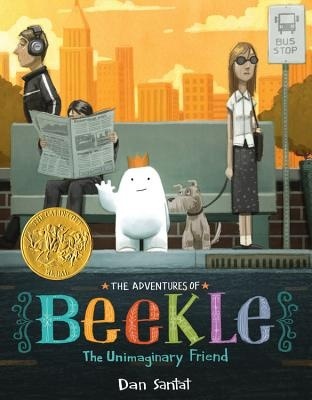 Beekle grew tired of waiting so he decided to go and find that friend in the real world all by himself. Into the unknown he sailed facing darkness and dangers. It required great courage to face it all, but the thought of someone special waiting at the other end kept Beekle going. When he finally made it to the land of children, things were trickier than expected. What do you do when you’ve never had a friend before? This adventure into the land of friendship will tug at your heartstrings. It’s a little bit sad, but sweet and funny, all at the same time.